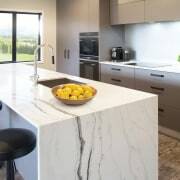 Designed by Kim Primrose of Mastercraft Kitchens Pukekohe, this kitchen benefits from sleek 20mm-thick Smartstone benchtops in Statuario Venato with a polished finish – an ideal complement to the cabinetry and floors. 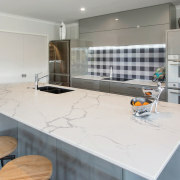 Smartstone polished surfaces are offered in four price brackets to suit a variety of projects and budgets, with Statuario Venato in the Exclusive range. As one of the leading surfaces in the kitchen, your choice of benchtops can have a dramatic impact within your design. The trick is selecting a benchtop surface that’s enduring, affordable and simply a pleasure to look at every day. 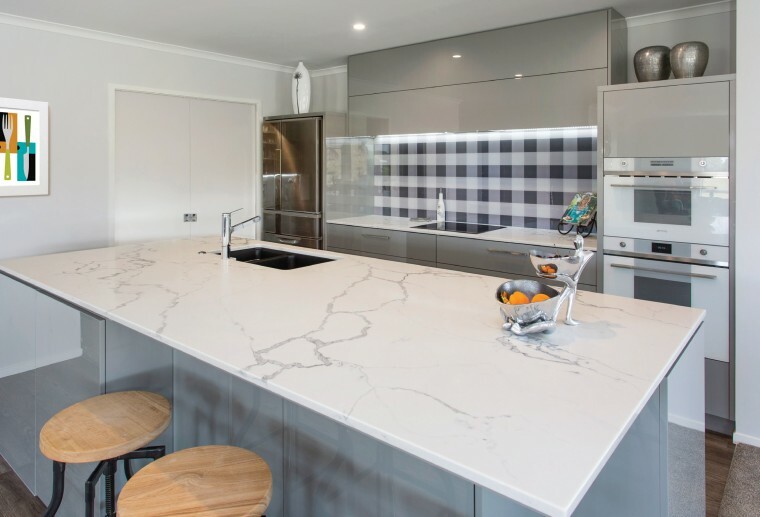 Smartstone is the ideal solution for any benchtop in your home, be it kitchen, bathroom, laundry, living or other areas, says Smartstone NZ sales manager Doug Angove. Smartstone is manufactured with at least 93% quartz, combined with pigments and resins, which makes it extremely durable. This means Smartstone is highly resistant to scratches, stains – including those dreaded red wine marks – and chemicals. In addition, it never requires sealing. As well as all these pluses, so vital in a hard-working kitchen, Smartstone surfaces boast the standout hero quality to lead or lift any kitchen design. The New Zealand collection comes in a broad array of 31 colours and is now offered in a larger, more versatile slab size. This option can be more economical for architects, designers, specifiers or homeowners and presents even more design possibilities. This eye-catching kitchen, also by designer Kim Primrose, features Smartstone Bianco Molasa. Smartstone surfaces offer many design possibilities – for example, the marble-look veined patterning on this island countertop is continued down the waterfall side to elegant effect. Smartstone surfaces are offered in a variety of thicknesses to suite every designer’s and homeowner’s tastes. Smartstone also ticks all the boxes in terms of hygiene and green design. It’s compliant with the International Health and Safety Foundation standards as being safe for food environments. 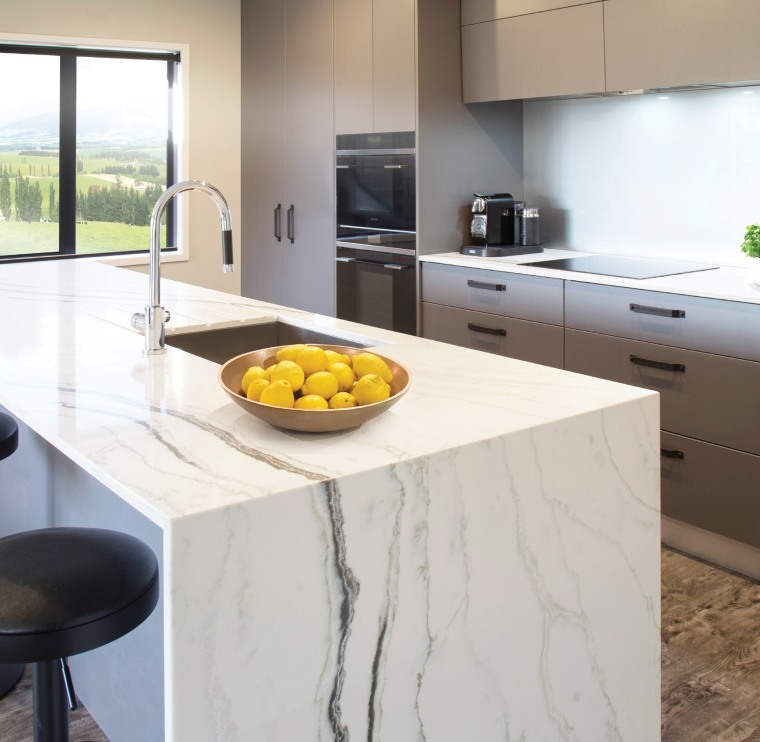 Similarly, Smartstone quartz surfaces have achieved Greenguard Certification – meaning Smartstone has met the most rigorous standards for low emissions of VOCs into indoor spaces.